Have you ever thought, sitting at a table in the All Inclusive hotel restaurant, that Turkish cuisine is one of the richest in the world? And indeed, many of the tourists can not even imagine - what a diverse selection of dishes Turks can present to their guests. And each region has its own cuisine, its own characteristics. And try them all is not enough, and the year. 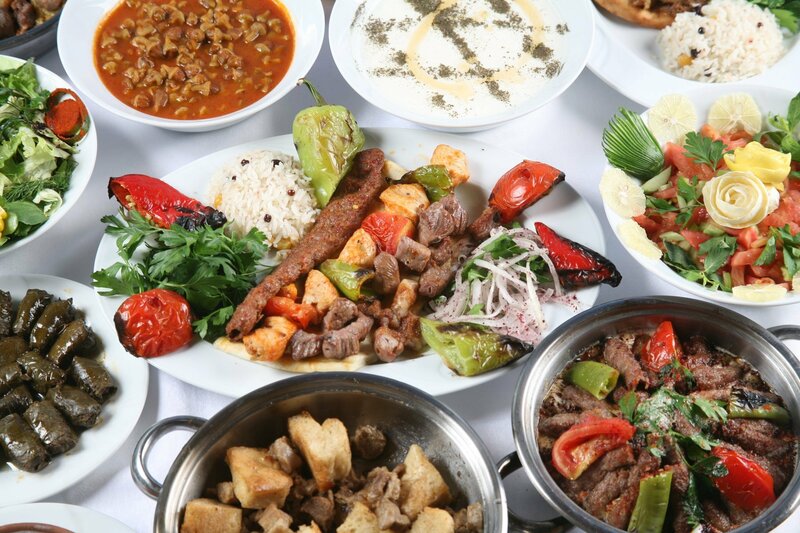 Turkish cuisine - what could be better? Turkish cuisine can rightly be given the third place after the French and Chinese, both in terms of the variety of dishes and their taste. And the thing is that the Ottoman Empire, which had existed for more than 500 years, once occupied a huge territory, and the peoples living in it, contributed to the Turkish chefs and revealed many secrets. It will be a mistake to assume that meat dishes play a dominant role here. On the contrary, vegetables in Turkey are kings of the table. And the most popular among them is eggplant. That just do not cook from the so-called "blue". And a delicious appetizer with yogurt and garlic, and juicy moussaka, stuffed them with meat, onion and garlic, baked in the oven. By the way, one of the popular dishes here is called Imamayaldy's “syncope”. It is a stew of eggplants, carrots, tomatoes, flavored with garlic and spices. A huge amount of "goodies" and snacks are made from zucchini. It serves delicious dishes of artichokes, celery, cauliflower and broccoli. The Aegean coast is famous for the herbs that are served to the table, seasoned with olive oil and lemon juice. Special respect in Turkey is given to legumes: beans, beans, nohut. No wonder, because this is a storehouse of vitamins, protein and useful trace elements. Beans are dried, cooked fresh, and even with the pods. In general, for every taste. The central part of Turkey is famous for its meat dishes, and, first of all, kebabs are very popular here. This meat (usually lamb or veal), cooked on an open fire or tandoor (large stone oven). The most popular is doner kebab. Meat, sliced, strung on a thick skewer and cooked over an open fire. The skewer constantly rotates, so the meat is roasted evenly. After which it is cut into thin slices. Served either wrapped in pita bread with vegetables, or on a flat cake, which is called pide. The famous Iskander kebab is cooked in the same way. It is said that the author of this dish was Alexander the Great himself. The barbecue known to us is no stranger to the Turks. In Turkey, it is called shish, though it is cooked either from chicken or from mutton. Especially popular here are kofte - lamb chops or beef with spices and garlic. Turks know how and love to bake. And they do it at the highest level. Why are only the famous Turkish pide - cakes of thin dough in various fillings: meat, cheese, vegetables. And if you go to the pastry shop in the morning, you will see a huge number of buns (poacha), simits, cake breasts (pies), and so on. Well, sweets deserve special attention. And not only baklava and locum. This includes dairy desserts: sütlach (rice pudding), kazandibi (a crumbly dessert with a ruddy crust), keshkül (rice pudding with almonds), muhallebi (a dairy dessert made from rice flour. And flour delicacies: kadaif, gullach, shekerpare, etc.). even sweets from pumpkin (tavern tatlysy) and chicken breast (tavuk geysu). The variety of Turkish soups can also be envied. What only the Turks did not come up with. The easiest and most popular: merdzhimek chorbasy, which is made from ground lentils and vegetables. Turks like Yayla Chorbasy soup made from yoghurt, rice and mint. For us, such a dish is unusual, but if you taste it, then later, as they say, you cannot pull it off by your ears. No less popular in Turkey is a soup called Ishkembe. Prepared from beef tripe with eggs, onions and garlic. Here they even came up with the bride's soup - Ezogelin Chorbasy. Cook it from red lentils, tomatoes, rice and bulgur. In general, the Turks make soups of almost everything, even lamb brains and beef legs. And to taste these soups are excellent. As in any country that is located on the coast, they love seafood and fish very much. And in Turkey, especially in resort towns, such food is in high esteem. Fish is usually cooked, grilled or baked in the oven. But salted or smoked fish is not popular. Turks consider it raw. Shrimps, squid are also cooked here, mussels are stuffed with rice and spices, and in coastal cities they are sold on almost every corner. In Turkey, everyone will find dishes to taste. And, most importantly, to try the kitchen, for example Gaziantep or Adana, it is not necessary to go there. After all, in our beloved Alanya and Antalya there are many restaurants, where the cuisine of different regions of the sunny republic is presented.